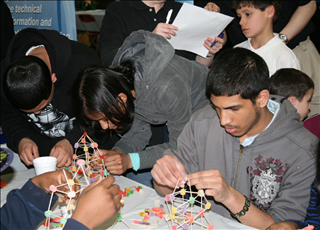 The Engineering EXPO is a fun, hands-on learning event with a goal of teaching students and adults how engineering impacts what we eat, how we work, play and learn, to how we travel, communicate and stay healthy. More than 100 engineering exhibitors are participating, including representatives from over 40 of the region’s leading learning institutions such as Rutgers, Cornell, Columbia, Penn State, Villanova, Manhattan, RPI and SUNY. All fields of engineering will be featured: Civil, Structural, Chemical, Electrical, Biomedical, Computer, Mechanical, Petrochemical, Environmental, Materials and Nuclear. Both the NYSSPE Rockland and Westchester Chapters will be exhibitors and our Executive Director, Anthony Fasano, P.E. will be at the EXPO as well. Engineering EXPO founder and organizer and NYSSPE member Mal McLaren, P.E., President and CEO of McLaren Engineering Group of West Nyack, N.Y., said engineering ranks No. 1 in career opportunities for college graduates and he encourages parents of school-aged children as young as middle school to attend Engineering EXPO to expose them to the field. “Engineers play a key role in virtually everything we do,” McLaren said. “However, U.S. businesses are experiencing a shortage of engineers, with 89% saying they have difficulty filling engineering positions. Our country and economy needs many more trained engineers and the EXPO is designed to help meet this demand by encouraging more students to pursue engineering studies. The doors open at 11 a.m. and the EXPO runs to 4 p.m. at White Plains High School, 550 North Street in White Plains. Free parking is provided and food/beverages are available for purchase. Plus, there will be plenty of giveaways and prizes, including Apple iPads. More information is available at www.beanengineer.org and on Facebook/LowerHudsonValleyEngineeringExpo.